GET 20 Single CD Games with FREE extra shipping fee ! If you buy the console from us with expedited shipping service, we will not charge extra shipping fee for up to 20 Single CD games ! *Service not available to South America. If you’re looking at these AES consoles then you pretty much already know what you’re getting yourself into. A pricey product considering it’s age but a sought after console comes with at a high price regardless of its age. Takes me back to a time before having to wait ten minutes for a quick five minute game or having to wait for your console to update for half an hour. I always wanted one as a kid and I personally bought this machine just to own one. Bring arcade games back to life! 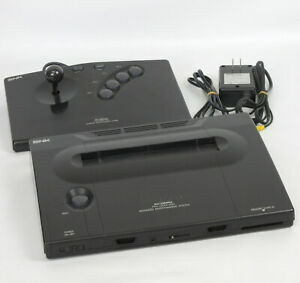 The Neo Geo is a unique games console. Don't expect any deep rpg games, or RTS games or adventures. What you get is Arcade perfect games, it's perfect because it is the same hardware as used in the Arcade and so are the carts! Get ready for Arcade heaven! If you weren't around when arcades were hyper popular, get this with a cheap game, I recommend Samurai Spirits/Shodown 2, should about £50. 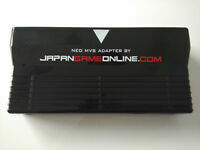 You will be impressed with the awesome joystick, and the sheer size of the game cart! Then you'll play the best 2D fighter you have ever played, forget Street Fighter IV on the PS3! If you remember the arcades, then you probably know how good this system is, if not and you loved the arcades, don't think twice. You will probably get addicted to a very expensive past time, which is collecting the games! Don't worry though, as these games gain value quickly so you aren't wasting money like you do with modern consoles, you are actually making sound investments and getting the chance to play unique, true retro, arcade perfect and simply amazing games, especially 2 player! If you can afford it, get one while they're still somewhat affordable. A classic cd base system of old. 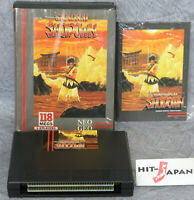 Neo Geo needs no interpretation. 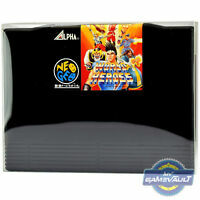 This cd version was made to make neo geo games more affordable to the masses. It's downfall is the loading times, but it's not too bad. I can only recommend purchasing this system if you are comfortable about loading times, and only want the core games. This system is only good with some fighting games, but not all, as far as loading times are concerned. Perfect . 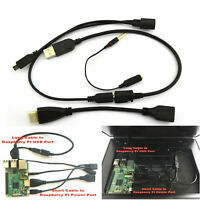 Fast delivery and product 100%.